Gov. Larry Hogan and Lt. Gov. Boyd Rutherford at a recent cabinet meeting. Gov. Larry Hogan heads back to the hospital Friday for his fifth round of chemotherapy to treat stage 3 lymphatic cancer, but there’s no respite for his staff during his five-day stays. Lt. Gov. Boyd Rutherford said the steroids Hogan takes as part of his treatment keep him “up all night so he’s focused and concentrating,” shooting off emails and text messages to his staff throughout the night. Rutherford shared the story with the crowd at a fundraiser for Republican state Sen. Ed Reilly in Harwood, south Anne Arundel County, Thursday night. “The governor’s doing very well,” said Rutherford. “He still the same Larry,” in good spirits, with sometimes cutting humor, though he does get more tired. Rutherford was expected to be the inside man helping run the administration, while Hogan was the outside man and voice and face of the administration. But with Hogan’s treatment and his need to rest and avoid some public contact while his immune system is compromised, Rutherford has taken on a more visible public role. “We decided early on we would operate in a partnership,” said Rutherford. 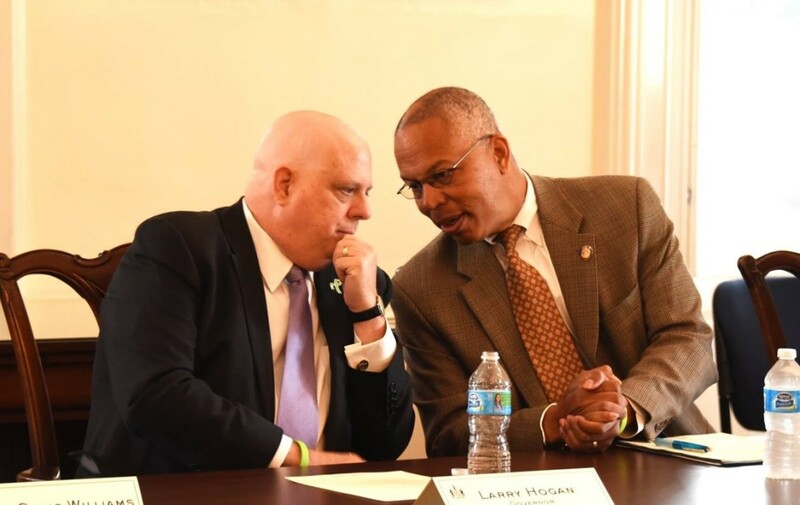 “The governor still sets the direction and makes the final decisions.” But the lieutenant governor “has a seat at the table” and has access to Hogan whenever he wants. “It has worked out quite well,” Rutherford said. After these personal observations, Rutherford gave the routine rundown of the major accomplishments of the eight-month-old administration — best job growth in the Mid-Atlantic, no new taxes for the first time in eight years, regulatory reform and cuts in taxes, tolls and fees. One would expect a Republican governor to support his party’s nominee. Gov. Larry Hogan, though, is artfully avoiding that move.